We had two pairs of free tickets to Gaggle’s gig at The New Empowering Church to give away. NB: This offer has now expired. Congratulations Suswati and Kirsty! We’ve got two free pairs of tickets to give away for all-woman punk choir Gaggle‘s Christmas show at the New Empowering Church (Westgate Street, London) on 15 December (this Thursday)! 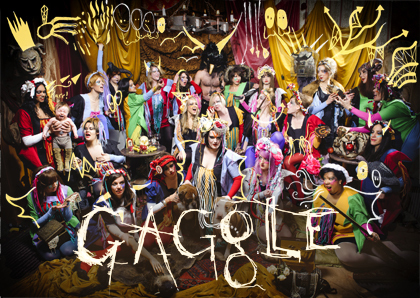 Led by Deborah Coughlin of 586, Gaggle have been described as “a response to boring man bands, bad burlesque and an alternative place for women in music that doesn’t involve drinking yourself to death out of boredom or anxiety.” Their most recent performance, a radical reworking of The Brilliant and the Dark, at the Elgar Room at the Royal Albert Hall was sold out so grab this opportunity while you can! Picture of Gaggle supplied by Work It Media. Edit: This offer has now expired and winners were informed at 19.00 on 14 December (see second comment below). Awesome song/video, but gross warning for those who, like me, absolutely hate ma**ots!